The programme for the Centre for Comparative Psycholinguistics’ Spring Training in Experimental Psycholinguistics 2019 has been announced! This year’s STEP@CCP will be held from May 13 – 18 in Edmonton, Alberta, at the University of Alberta. The Spring School is directed at postdoctoral fellows, graduate and advanced undergraduate students, and anyone else interested in learning how to turn their research ideas into concrete steps towards experimental designs, data collection and analysis using advanced experimental and statistical methods. The registration deadline is April 29, 2019. Course fees are set at $390, and include workshop attendance and materials, tea/coffee, light snacks, and 6 days of lunches. The Centre for Advanced Research in Experimental & Applied Linguistics (ARiEAL) at McMaster University in Hamilton, Ontario, is hosting a workshop on Bayesian modelling on the morning of January 15th, 2019. In recent years, Bayesian inference is gaining increasing popularity. This workshop will serve as a brief introduction to this exciting alternative analytical approach, focusing on do-it-yourself modeling techniques, which allow for maximal flexibility and transparency in data analysis. In a nutshell, such techniques are based on the specification of a generative model that presumably gives rise to the observed data. To do so, one specifies the relevant latent parameters, prior distributions regarding these parameters (reflecting researchers’ a-priori knowledge), and relations between the various parameters as well as between parameters and observed data. Dr. Noam Siegelman (Haskins Labs) will go over basic concepts such as prior and posterior distributions, learn how to specify and interpret graphical models, and practice the implementation of such models using R and JAGS. He will also discuss the difference between Bayesian modeling and Bayesian statistics and the relation between Bayesian parameter estimation and Bayesian model selection via Bayes Factors. RSVP: If you are interested, please email ariealrc@mcmaster.ca by Monday, January 14, 2019. Space is limited. Basic knowledge and experience with R is required. Basic knowledge of Bayesian statistics is recommended, but not required. Please note you will need to bring your own laptop with R installed. Prior to the workshop, please follow the instructions to install JAGS. The Centre for Advanced Research in Experimental & Applied Linguistics at McMaster University (ARiEAL) welcomed more than 30 students from Hamilton District Christian High School on November 21 to learn about the science behind second language acquisition. The students are studying French, and have an interest in understanding how people learn languages. Students toured three on-site laboratories, including co-applicant Dr. Victor Kuperman’s Reading Lab, and met with five faculty members as part of their introduction to second language research. The event was co-sponsored by Words in the World. Dr. Victor Kuperman and The Centre for Advanced Research in Experimental and Applied Linguistics will be hosting a one-day workshop on “How to gain insight into reading processes – recreating (or improving) eye-tracking studies from the Turku eye-movement lab” on May 9, 2018. The workshop is offered by noted expert Dr. Raymond Bertram of the University of Turku, and will run from 10am – 4pm at McMaster University in Hamilton, Ontario (Room TBA). For more information about the workshop, visit the official ARiEAL announcement here: https://arieal.mcmaster.ca/news/workshop-how-to-gain-insight-into-reading-processes. If you are interested in attending, please contact ARiEAL as soon as possible, preferably by Friday May 4th, at ariealrc@mcmaster.ca. Applications are solicited for up to two, one-year postdoctoral fellowships, with the potential for renewal, in the Department of Psychology at the University of Alberta, supervised by Christina Gagné and Thomas Spalding. This project is supported by SSHRC and NSERC funding to the supervisors. The supervisory team is looking for postdoctoral researchers who have demonstrated expertise in psycholinguistics, computational linguistics, or cognitive psychology. Experience in and knowledge of the literature on compound processing is particularly sought. Experience with databases, corpora, and programming in various languages is a benefit. 1) Design, programming, and analysis of psycholinguistic experiments. 2) Preparation of publications and presentations. 3) Supervision of undergraduate and graduate students and general lab management. 4) Management and programming for a large-scale database. Candidates should begin with an introductory email to Drs. Gagné (cgagne@ualberta.ca) and Spalding (spalding@ualberta.ca). Formal applications will include a CV, publication list, brief statement of research interests, and three letters of reference. Applications will be assessed as they arrive. Position open until filled, however, a start date no later than August 30, 2018 is expected. The 11th International Conference on the Mental Lexicon will bring together psycholinguistic, neurolinguistic, and computational research on the representation and processing of words in the mind/brain. The conference encourages a variety of perspectives on lexical representation and processing. The 2018 conference will be held in Edmonton at the Delta Hotel, Edmonton City Centre, Alberta, Canada, where it was first launched in 1998. 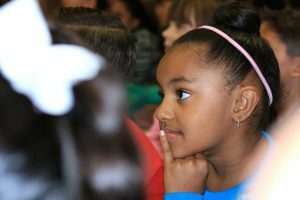 As in previous years, we anticipate an excellent selection of high quality research presentations on topics that include, but are not limited to, computational models, neurolinguistics, language processing in development, bilingualism, and typical or atypical populations. There will be two keynote speakers: Mirjam Ernestus and Gabriella Vigliocco. Like the previous meetings, the conference will include both 15-minute platform presentations and poster sessions each day. The updated deadline for receipt of abstracts is April 28, 2018. The abstract submission page will open Feb. 15, 2018. Please consult the Abstract Submission Guidelines on the conference website at mentallexicon2018.ca. Looking forward to seeing you in Edmonton! Research Report: So you think you can spell? You just read a word with a spelling error that we see in 39% of occurrences of “innocent” in social media. Recent research from the Reading Lab at McMaster demonstrates that spelling errors are harmful in that they make readers “unlearn” the correct spelling, and do so every time an error is encountered. This detrimental effect of variability in spelling affects all readers, even those whose own spelling habits are impeccable. In two studies using the state-of-the-art eye-tracking technique and a behavioural lexical decision task, undergraduate student Sadaf Rahmanian and Dr. Victor Kuperman at the McMaster Reading Lab showed that readers took longer to recognize words that were spelled correctly, if those words were more frequently misspelled in unedited sources like social media. Sadaf concludes: “Praise be to spell-checkers, literacy instructors, proof-readers and editors, who keep spelling consistent.” The findings were published in the leading journal on literacy and reading research Scientific Studies of Reading. The Words in the World Project has launched a “Research Topic” in Frontiers in Communication Research. The goal of this Research topic is to bring together the latest insights, findings, methodologies, and analytic techniques that advance the understanding of lexical knowledge and lexical ability, particularly in relation to real-world communication. New corpus resources, statistical techniques, and data visualization tools that can reveal the dynamic interaction of variables involved in lexical processing. Reports of application of lexical processing research to the solution of real-world challenges. We are particularly interested in submissions that are co-authored by established researchers and trainees (e.g., students and/or post-doctoral researchers). Abstracts should be submitted through the Frontiers’ special topic page for Words in the World. The deadline for Abstract submission is January 31, 2018. The deadline for article submission is October 31, 2018. Research Report: It’s not what you say; it’s how you frame it. Think of the verb “cause.” Does it make you feel emotional? Most likely, not. Now think of the contexts in which this verb occurs: cause problems, cause damage, cause harm. The framing of ’cause’ is emotionally negative. A recent study by a PhD student Bryor Snefjella and Dr. Victor Kuperman from McMaster Reading Lab, published in a premier psychology journal Cognition, shows for the first time that contexts are as powerful in determining emotionality of an English word, as the word itself. Snefjella, B. and Kuperman, V. (2016). It’s all in the delivery: Effects of context valence, arousal, and concreteness on visual word processing. Cognition, 156, 135-146. 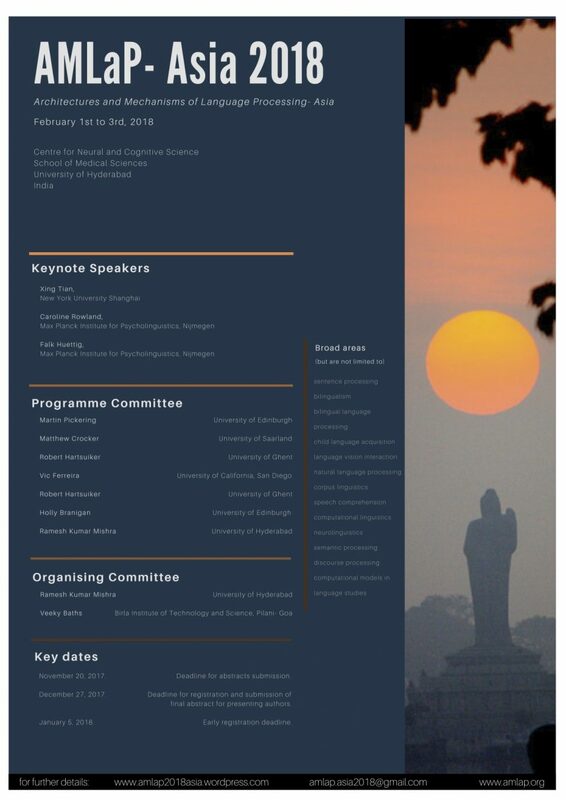 Architectures and Mechanisms for Language Processing – Asia (AMLaP-Asia) 2018 will be held at the University of Hyderabad in Telangana, India, from February 1 – 3, 2018. Abstract submissions will be open until November 20, 2017. For more information, visit the conference webpage here. Words in the World: Advancing the next generation of research leaders through training, collaboration, innovation, and mobilization.